Signs, training materials and supplies from Safety Emporium can help ensure a safe and healthy workplace. Pneumoconiosis is fibrosis and scarring of the lungs due to the chronic (long-term) occupational inhalation of dusts such as coal, silica or asbestos. Silicosis is the most common form of pneumoconiosis and is caused by inaling free silica or crystalline silica (SiO2). Asbestiosis is a form of pneumoconiosis caused by inhalation of asbestos fibers. There are additional forms of pneumoconiosis that affect coal miners, welders, hard mineral dusts, talc, kaolin and more. See the first link under Further Reading below. SDS's will warn of pneumoconiosis if the material is known to cause this kind of damage. Pneumoconiosis is a serious hazard at locations where dust is produced. Examples include coal mines, quarries and foundries. Breathing dust day after day is not normal and can result in permanent lung damage. Always take care to minimize the formation of dusts in the first place and use adequate personal protective equipment (PPE) such as dust masks or respirators in the presence of such materials. Keep in mind that the lung damage caused by inhalation of dusts may initially not cause any symptoms, even though damage has been done. If you wait until symptoms appear before taking appropriate precautions, the damage may be irreversible. The American Lung Association's Pneumoconiosis web page. Pneumoconiosis at Johns Hopkins Medicine. Coal worker's pneumoconiosis at the NIH's MedlinePlus Encyclopedia. 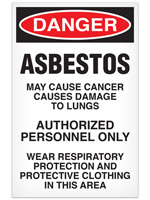 Coal worker's pneumoconiosis at eMedicine.com, written for physicians and health professionals. Silicosis at the American Lung Association. Protect Yourself, Silicosis at OSHA. Asbestiosis - Symptoms & Causes at the Mayo Clinic. Asbestiosis at the American Lung Association. Pitfalls in Diagnosing Occupational Lung Disease (OLD) for Purposes of Compensation at OSHA, by Lawrence Martin, M.D. Prognostic effect of tuberculosis on patients with occupational lung diseases at the US National Library of Medicine. Entry last updated: Monday, February 25, 2019. This page is copyright 2000-2019 by ILPI. Unauthorized duplication or posting on other web sites is expressly prohibited. Send suggestions, comments, and new entry desires (include the URL if applicable) to us by email.